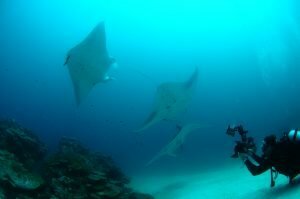 Travellers to The Maldives in 2018 can combine their PADI Open Water Diver certification with a week-long cruise onboard a luxury liveaboard. 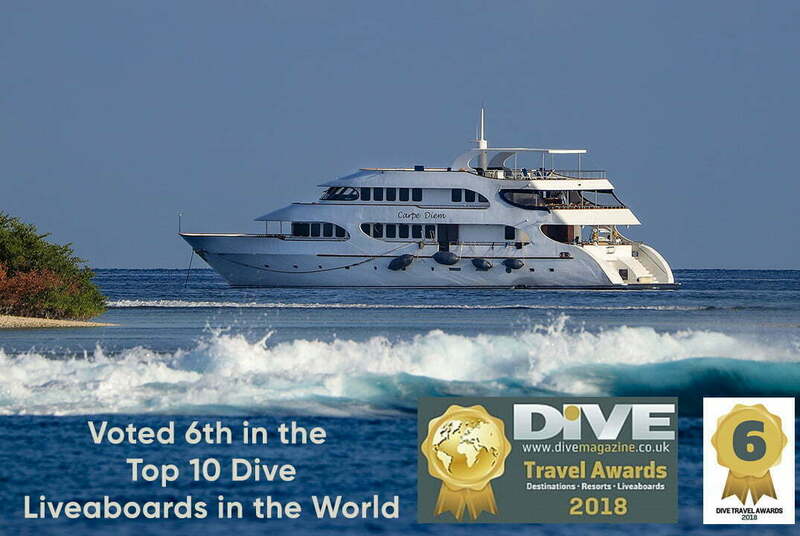 The Maldives is continuously rated as one of the top diving destinations in the world by international dive publications and awards. Made up of 26 coral atolls and crossing the equator, roughly 1,200 islands are home to some of the most beautiful, thriving reefs of rare and common coral, attracting every kind of marine life. With a destination that is surrounded 99% by water, Carpe Diem Maldives believes any traveller to the region should be in, on, or under the ocean to truly appreciate it’s beauty. Spending a week exploring different lagoons and reefs on board an award-winning luxury liveaboard cruise, complete novice scuba divers can now do this in style with Carpe Diem Maldives. Introducing the scuba diving experience to all travellers, in 2018 Carpe Diem Maldives is offering beginner divers the ultimate dream holiday. For one week in July, a 7-day cruise on Carpe Vita will be dedicated to 20 adventurous travellers looking to obtain their PADI Open Water Diver certification. Starting in Male and ending in Baa Atoll, northern Maldives, guests will experience the beauty of coral reefs and a myriad of fish starting from just 3 metres beneath the surface. Learn to Dive cruise weeks begin with shallow and calm lagoon dives. With the fundamentals of diving firmly mastered, 4 open water dives on beautiful coral bedecked reefs will complete the certification. By the end of the week, novice divers will be confidently enjoying the mesmerizing underwater world at 20 metres below the surface. Each of these special trips will also include a snorkelling visit to the region’s annual manta ray migration in Hanifaru Bay, Baa Atoll, a UNESCO protected marine biosphere area. Under the guidance of Carpe Diem’s expert Maldivian Dive Instructors, guests will learn the PADI Open Water theory in the briefing room on board Carpe Vita luxury cruise. Equipped with the latest dive gear, guests then step onto a dive dhoni for their first plunge into lagoon waters. With increased confidence and applied theory, divers return to the main cruise vessel after each dive to enjoy breakfast, lunch, and dinner on the upper deck. Around a long table, mealtimes quickly become an enthusiastic exchange of underwater observations and shared experiences. Accommodation is on the boat, in twin bed and double cabins, each with private bathrooms, air conditioning, 24 hour electricity and wifi connection. Not included in the package are one-way domestic or seaplane transfers from Baa Atoll to Male International airport. These can be arranged by Carpe Diem and guests can also combine their cruise with a resort stay in Raa Atoll at the new Carpe Diem Beach Resort and Spa, opening July 2018. For cruise guests staying at the resort, three complimentary dives are included in the full-board stay package, making it the perfect opportunity to practice those certified dive skills on a thriving house reef. Stays at the resort start at USD 450 per night for solo travellers in a shared twin-bed pool villa. By the end of each PADI Open Water Learn to Dive week, guests will have a dive log that begins with enviable diving in The Maldives. Since 2008, the award-winning hospitality group Carpe Diem Maldives Pvt. Ltd. has been operating luxury dive and surf liveaboard cruises, sharing the beauty of the Maldivian waters with adventurous travellers. Carpe Diem is the only liveaboard operator in the Maldives to offer diving adventures with a team of all-Maldivian Dive Masters. 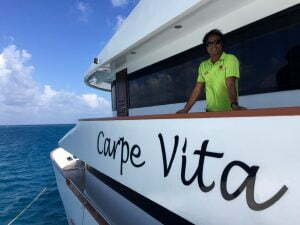 With the expansion into resorts, Carpe Diem Maldives becomes the only hospitality brand in the country to offer year-round liveaboard cruises that can be combined with a resort stay. [:en]Building on the success of three marine expeditions in 2017, in partnership with US based research organization Coral Reef CPR, Carpe Diem Maldives Cruises is excited to announce its 2018 Dive with a Purpose series of hands-on marine expeditions for leisure divers. The first two weeks in the 2018 Dive with a Purpose programme are in partnership with Maldives Whale Shark Research. In July, we welcome renowned marine biologist Steven Weinberg on board for two weeks as he documents and researches his field guide on the Indian Ocean. His July visit marks his first return to The Maldives in over 25 years! Taking a concerted approach towards protecting and restoring the health of coral reefs and marine life in the Maldives, a “Rescue a Reef” week in September with experts from Coral Reef CPR will look at addressing issues around reef predators, damage prevention and restoration. There is a growing school of thought that the Maldivian ‘big three’; whale sharks, manta rays and turtles react to the changes in the monsoon seasons by moving to sites on the leeward side of the atolls. In May 2018, Carpe Novo will become a research platform for biologists from the Maldives Whale Shark Research Programme providing them and 20 lucky guests an unprecedented opportunity to explore this phenomenon. The goal of this particular Dive with a Purpose expedition is to begin the 2018 southwest season’s data collection, documenting the movements of these iconic yet enigmatic animals. There are two monsoons in the Maldives, ‘Iruvai’ as the Maldivians call the northeast monsoon between December and April and ‘hulhagu’, the southwest monsoon from May to November. How quickly these megafauna species transition from sites on the west coasts to sites on the east coast and vice versa is not defined and probably depends on currents and surface weather conditions. The MWSRP will be setting out on Carpe Novo with the aim of seeking whale sharks, as well as manta rays and sea turtles at differing points amongst the central atolls. Whale sharks, manta rays and turtles will be photo identified, with individuals compared to previous sightings in national level databases to identify movements between locations, both within and between atolls. Equipment will be deployed to gather data on current and surface weather conditions in the hope of gleaning information on how quickly the 2018 season has changed and how the megafauna has reacted to it. Special attention will be paid to whale sharks which have moved from other atolls, where a fledgling understanding of seasonal cyclic movements can be reinforced by any sightings of 29 individual whale sharks known to be regular inter-atoll travellers. In areas where whale sharks are prevalent, the MWSRP will explore oceanic conditions in the isolated parts of the atolls where whale sharks are not expected to be sighted through the deployment of temperature and current reading loggers and compare that to data collected in areas where whale sharks would be expected to be seen. Guests joining this expedition will be offered the opportunity to assist the researchers in the hands on equipment deployment and every data gathering aspect of their work and will be afforded nightly workshops, lectures and discussions on marine life and the leading edge findings from Maldives-specific research on these species. Coral Reef CPR, in partnership with Carpe Diem Maldives, has removed over 10,600 starfish from reefs in the Maldives since 2015. In the 2018 “Rescue a Reef” expedition in September, divers can expect a hands-on role in eliminating the starfish from badly infested reefs, repositioning newly grown corals from a nursery onto a reef, and planting new juvenile corals for growth on the nursery ropes. Divers will assist the Coral Reef CPR scientists in collecting valuable data on the behaviours of the starfish and their genetic make-up, as well as the rate of coral growth on nursery ropes. In addition to the starfish removal from reefs, we will also visit a number of unique reef environments, including submerged farus and giris to explore the invertebrate life as and also collect valuable data on the diverse and colorful reef fish communities and larger megafauna such as sharks, manta rays and turtles. During these dives and starfish removal dives, we will conduct quantitative transects to measure the health of the reefs and patterns of recovery following the 2016 bleaching event. Working in buddy teams, divers will be assisting Coral Reef CPR scientists in all aspects of research, including reef assessment surveys, collection of samples, and removal of starfish and coral eating snails. 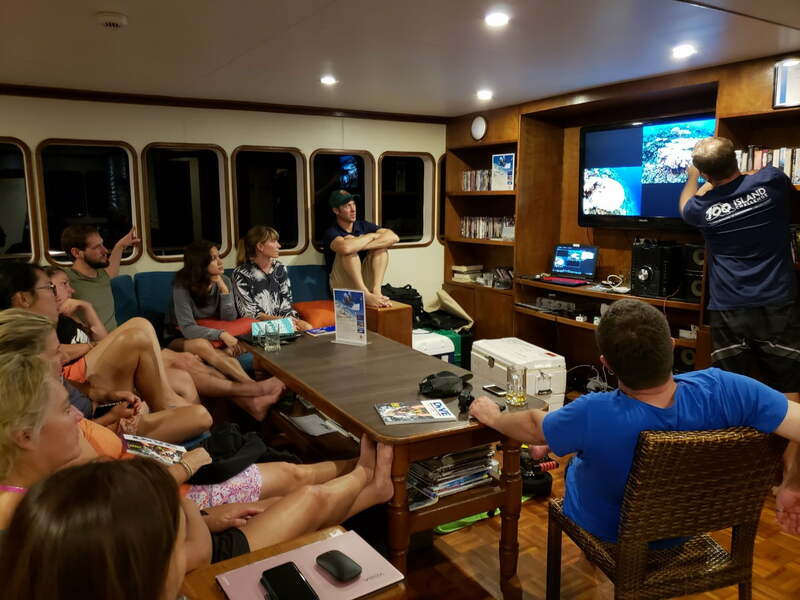 In the process, divers will be trained in reef conservation methods and survey approaches, and learn about coral reefs and the vibrant and diverse life found on reefs through nightly workshops and discussions. Joining these “Rescue a Reef” expeditions will provide divers with an opportunity to be part of a team who are saving thousands of hectares of reef and preventing the potential for future outbreaks.